When you walk into our office, you will be greeted with a friendly smile by our knowledgeable and experienced Chiropractic Assistants. From the beginning, you will know that we care about your health and well being. Don’t worry – there are no surprises here, we explain everything in advance. Chiropractic care normally involves a series of visits during which we will address the cause of your problem, not just the symptoms. We care for your entire family – no one is too young or too old. At Stuckey Chiropractic, we improve lives every day. WE CAN HELP! FIRST VISIT : To find out if we can help you, we ask questions and listen. REPORT OF FINDINGS VISIT : We’ll report what we found and answer all your questions. TYPICAL VISIT : A typical visit will be much shorter, but just as important! So, check out some of our reviews and then contact us to make an appointment. 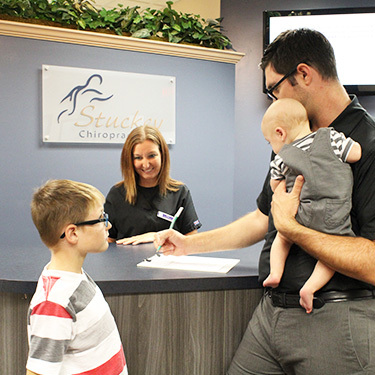 All of us here at Stuckey Chiropractic look forward to meeting you.